Peyton recognized it the first time he heard Tito Salinas play the pieces. When the performance ended, he asked if the three pieces were transcripts of something by Debussy. Tito only said they had come down to him from his an aunt. When Peyton got back to his apartment that night, he called Caroline. Peyton knew he was not chasing a phantom. Tito Salinas was one of six in their graduating, class and one of four guitarists (two students had majored in lute performance). He, like Peyton and Caroline, had ignored warnings from teachers and relatives on how difficult it was to succeed as a classical guitarist. Only seven people in the world, all of them were told, made enough money to live on just by playing guitar. The option of teaching provided the only path to a real living—but even with this option, the glut of teachers dampened the job market. Tito still wanted to make it as a performing musician, he had told Peyton, and played concerts wherever he could get them. The coffee bar gig had been one of these performances. The impressionistic pieces that sounded as if they were written by Debussy, plus the fact that Tito was a relative to Llobet, put the stamp on Peyton’s hunch. Convinced of their origin, he began to scheme how he might get them for himself. The story Caroline called apocryphal had it that Llobet, a renowned guitar playing in Paris during the late 1800s, caught the attention of Debussy. The composer approached him after a performance, introduced himself, and invited Llobet over. “Why don’t you come and dine with me and then show me what the guitar can do?” Debussy was said to have asked. Llobet, however, suffered from extreme shyness; and Debussy had the reputation of being gruff, so Llobet never accepted the invitation out of his fear of the composer’s rough manner. Guitarists lamented this turn of events. They wept to think that if Llobet had demonstrated the instrument’s dynamics to Debussy, he might have written some music for the guitar. The story was not apocryphal, he saw. It really happened. Those who told it, though, had got the facts wrong. Llobet had visited Debussy. He had shown him what the guitar could do. Debussy had written at least three pieces for the instrument. He went to see Caroline later that night. She lived in a partitioned section of an old Victorian house—one divided up into apartment, as often happens to old houses in college towns. She lived in a corner tower in three rooms, one on top of the other. On the bottom was her tiny den and kitchen; above that, reached by an iron spiral staircase, you entered her studio, as she called it; the next story up you walked into her bedroom. When Peyton got there he heard “Capriccio Arabe” wafting from the room where she practiced. When he opened the door she called and told him to come up, though she did not interrupt the composition. He entered, climbed to the second floor and stood at the entrance until she finished. Caroline did not interpret at all. She played a piece as written. Most guitarists, Peyton included, put in pauses or Romantic flourishes. Caroline played with academic precision, though with considerable technical skill. He applauded. She stood, turned, and made a deliberately exaggerated curtsy. Caroline‘s red hair rose in a profusion of curls about her head. She had blue eyes and pale Celtic skin. Not tall, not thin, she still was not plump or chubby but what the French called rondelet (rounded). He liked her looks, as many guys at the conservatory did. He still wondered why she had picked him to bestow her favors upon. Caroline’s abilities as a guitarist put her at the top of the class. He admitted she played much better than he did. As a woman in a male-dominated profession, she had potential to succeed and become one of the few who could support herself by playing concerts and accepting an occasional visiting professorship at different schools. If she discovered and premiered pieces Claude Debussy had written for guitar, her career would be established. He nodded. Caroline never swore; she was scrupulously honest, attended an evangelical church each Sunday, and wanted no one to know of their liaison; conservative in many ways but liberal in her favors to him. When Peyton woke in the morning he heard her in the kitchen two floors down. He smelled bacon cooking. Peyton dressed and groggily descended. She had dressed and stood at the stove. “I’m not sure I want to go through with this,” she said as he sat at the table and poured a cup of coffee. She went on cooking bacon and did not reply. A week later Caroline saw Peyton at the Chocolate Shoppe, a local bar graduate students favored. He was with three of his friends and had gotten drunk. The four of them talked. His friends made moves on Caroline but finally left. She opened a manila folder and took out three parchment sheets of handwritten music. It was scored in treble clef. He could tell at a glance it was guitar music. The signature at the top of each sheet—was it really Debussy’s? He looked up at her. They went to her apartment. She played through the piece. When she finished, she was quiet for a long time. Finally, after as long as five minutes of complete silence, she spoke. The next time she saw him, Peyton was once more at the Chocolate Shop. Tito went to Ecuador not a week but two days later. Caroline graduated and, as if by providence, got a fellowship to study guitar at the Sorbonne. She asked Peyton to go with her. They were in love—and he could speak French. He had grown up in Vincennes, Indiana, where a few people from the old French-speaking community were still around, had picked the language up as a child, studied it in school, and spent a year as an exchange student in Lyon and Paris. After they had settled into fairly nice quarters and Caroline began her studies, they took the music to a musicologist who specialized in manuscripts. He sat in front of them, intensely studying the paper, and finally looked up. “It is Debussy’s signature,” he said. Peyton had remembered seeing facsimiles of Debussy’s signature. The moment saw the scrawl on the papers Tito had given them he had recognized it: the first name abbreviated as Cl, the three indistinct vowels, the D leaning left, the subsequent letters leaning right, the large, flourished y at the end. After the initial confirmation, they gave the school the originals. Experts tested the paper, ink, compared the orthography and showed the material to other experts. After confirming authenticity beyond a doubt, the Sorbonne announced that one of their students had discovered three pieces of hitherto unknown music that Claude Debussy had written—for guitar. The announcement caused a sensation. News of the compositions’ discovery made the front page of newspapers, went viral on the internet, and became the subject of radio and TV reports. Magazines like Guitar and Classical Guitarist sent journalists to interview Caroline. She appeared, with Peyton as her language assistant, on L’Monde. The two of them flew to New York to be interviewed for the Today show. Wearing an expensive outfit an adoring fan had bought for her, she talked about Llobet and gave the story of how they had acquired the manuscript. They did not give Tito’s name because he had requested they not reveal it to the media. When the scholars pronounced the pieces’ authentic, Caroline managed to find Tito’s address and wrote him a letter informing him of all that had transpired in the two years since he gave her the originals. They received a letter back from his wife. Tito rejoiced, she said, that the music would come to light, but he did not wish to have his name brought into the matter. He wishes to live quietly, she wrote. Peyton did not understand why the response upset Caroline so much. One night he found her crying at the study desk in their apartment. He put his arms around her and asked her what was wrong. She could not say, but they both knew it was related to the Debussy manuscript. He lay in bed that night and wondered why he felt somewhat the same. The two of them puzzled over reasons Tito might have had for turning his back on fame, recognition, and wealth. The wealth had been a surprise. They received offers hovering around a million dollars from more than one music publisher. Caroline insisted Peyton be a full partner in ownership of the manuscripts even though Tito had given them to her, not to him. She organized a debut concert. Caroline received endorsement offers, did magazine interviews for big money, received notices from music departments at top universities that they wanted her to teach. “If we just invest the publication money, we can get along even if neither of us works a lick for the rest of our lives,” Caroline said. It was only then that he realized she meant to marry him. They flew back home, were married in a small ceremony with their families and few friends in attendance, and returned to Paris to get ready for the debut of the Debussy pieces. Peyton wrote to Tito telling him the news; he responded with a short note wishing them blessing. The note bore no return address. When they wrote inviting him to the premier concert—Caroline offered to pay all expenses—the note was returned by the postal service, unable to find the recipient dwelling at that address. He had left no forwarding address. Caroline’s production company scheduled the debut for June 18 at Théâtres des Champs-Élysées—a smaller venue. The expensive tickets were made available to selected musicians and critics. The remaining tickets went on sale to the general public and were sold out within an hour. Peyton tutored Caroline in French so she could converse at the reception afterwards. She had also hired a native teacher and had improved vastly in the last few months. Several magazines ran articles on the pieces, attesting to their authenticity. Anticipation ran high. Peyton played them and agreed with Caroline that they were not particularly difficult to play as far as the physical execution of the pieces went. Their tonalities, however, demanded the kind of mastery she possessed and he did not. Debussy did not play guitar and so avoided the clichés guitar composers who also played the instrument often fell into. The complexity of the compositions amazed him. The pieces were substantial—major works, not vignettes or studies; two numbered sonatas and a longer composition titled “Nocturne for Guitar,” made up the program. After he had gone through them a few times, he noted how all the things that characterized Debussy shone through them: the rushes of beautiful melody, the radical harmonics, parallel and bi-tonal chords, persistent chromaticism, exotic rhythm, the tendency toward pentatonic scale. They exuded mystery. Like Claire de Lune, Afternoon of a Faun, and Beau Soir, they found their way through spellbinding arpeggios, abruptly shifting interludes, odd constellations of sound and shape. They cast their spell over him even as he concentrated on mastering the technical requirements of playing the compositions. Llobet had taught Debussy well. The pieces fit the guitar. No impossible stretches or undoable executions spoiled his delight in playing them. As the night of the premier concert drew nearer, Caroline made one last attempt to contact Tito. She managed to reach a relative and asked him where Tito had gone. The relative told her he had bought a farm and moved there with his bride. The farm, he said, lay in the outback. It was hard to get to. They did not have phone service. Peyton was not sure he believed that. Retreating to a hermit’s life, moving to the outback, eschewing civilization appealed to some people, never to him. He liked the bustle and energy of a city and the intellectual ferment of a university. Caroline said she could understand the impulse to retreat to a simple life. “In a lot of ways, it is; and I’m excited about it. In other ways”—her voice trailed off. “Anyhow,” she picked up, “it’s what I wanted and what I opted for.” That night she wept, as she had on many other nights. The night of the premier concert, the Théâtres des Champs-Élysées filled with beautiful people. Caroline, who had lost a little weight and worked hard on her French, looked marvelous in a red gown, hair coiffed, face done by a professional make-up crew. Peyton sat in the audience. Next to him a British man who had introduced himself as a journalist thumbed through a copy of Music & Letters; the issue featured Caroline’s article, “The Guitar Music of Claude Debussy,” published to coincide with the concert. Thoughtful, fluently written, representing knowledge of music history and theory (he knew, he had typed it for her), it discoursed on the three compositions she would introduce to an eager public this very night. After the concert, the publisher they had chosen would release the music for purchase. The first printing had already sold out from pre-release orders. As Peyton sat in the opulently dressed audience, he thought of the night he had first heard Tito play the music in a coffee bar in front of fifteen people who talked and sipped lattes as he performed. Maybe, he thought, Tito’s premier of the works that night had been deliberate. Knowing Peyton’s ambition, Tito might have played so he would identify the compositions and want to get his hands on them. Possibly, he wanted to unload them so he could return to land, place, and family and leave behind the hook that would attach him to the wider world. After a long, sententious introduction in French by a Sorbonne professor, Caroline, looking beautiful, guitar in hand, came out and sat in a chair with dark lacquered wood and a velvet cushion to perform the guitar music of Claude Debussy for an eager, breathless audience. As she played the composition hidden for a hundred years from public hearing, tears streamed down her face. The audience would think they came from the beauty of the music and her love of it. Peyton knew the other reason. 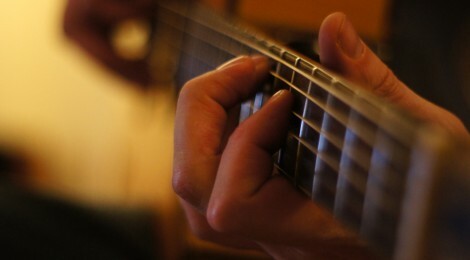 Image: Flickr, “Playing Guitar” by username: xlibber (xlibber), under the Attribution 2.0 Generic license. David Landrum's speculative fiction has appeared widely, most recently in Intellectual Refuge, Mystic Nebula, and Alban Lake Review. David's novellas, The Gallery and Strange Brew, are available from Amazon; a novel, The Sorceress of the Northern Seas, has recently been released by Netherworld Books, UK.